Below this you will see my original 5 star review. However, in the last couple months it continuously deletes my downloads. Instead of indicating a 100% download, everything is now 0%, awaiting download. I live in a rural area with very poor internet connection, so it is essential that I have books on my phone. Also, I rely on this app when I travel, but I can’t anymore if it keeps deleting my downloads. Please fix this. I had it on my iPhone 2, my iPhone 4 and now my iPhone 6s. If it were the only app on my phone, the cost of my phone would be worth it. So many books and so many genres to choose from! Some readers are better than others, but, hey, they are volunteers. I have about 50 books downloaded to my library which has slowed things down a little so I make sure now to delete the file and just keep the title. I love being able to store books to have on hand when I travel. I love being able to listen to all the science fiction selections and the history and biographies. I love being able to fall asleep to a book after a stressful day. Just download it and enjoy! What a passionate and meaningful book. Written intelligently and motivationally. A must read for those desiring a better society now and in the future. Don't miss the epilogue! I have assigned reading but none of the books are on there. They have a few choices of books but not enough if you ask me. Nice effort. Great idea. Unfortunately most readers of poor quality due i suppose to being volunteer; but irritating nonetheless. And a ridiculous amount of self promotion. My god, charge a small fee or something but every part starts with the same boring statement. Makes it all distracting and horribly distracting. Very good readers. I listen every day. Ever since I got this app it was good to have. Until this happen. 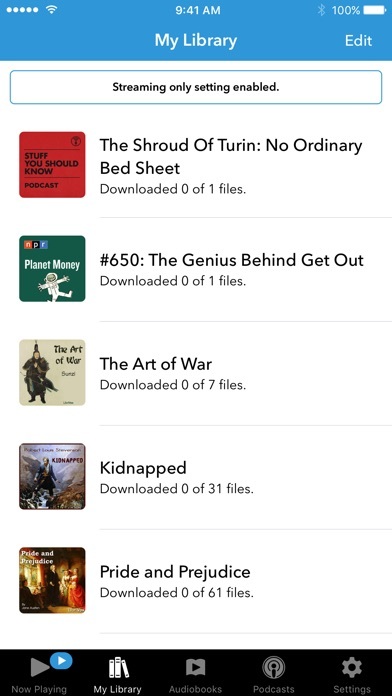 I had a library of books that has been downloaded with all the files, when I open the app, every downloading files are gone and start yet again download them once more. This happen to me twice and I'm sick and tired of having all the files downloaded for only the app self delete the books files. I'm done with this app. I used to love it and I enjoy it listening good books from there; just hate the idea of auto self destruct app and start over. I have zero time to waste for all the books files to be downloaded. Says it’s free and it’s truly free. Yes the books are older titles but there are tons of classics. This app makes reading books possible for me and I love it. Walk daily listening, so glad I found this wonderful app. This app is too good to be true and only downside is that I took this long to discover it! Thanks for making so many audiobooks available for free! 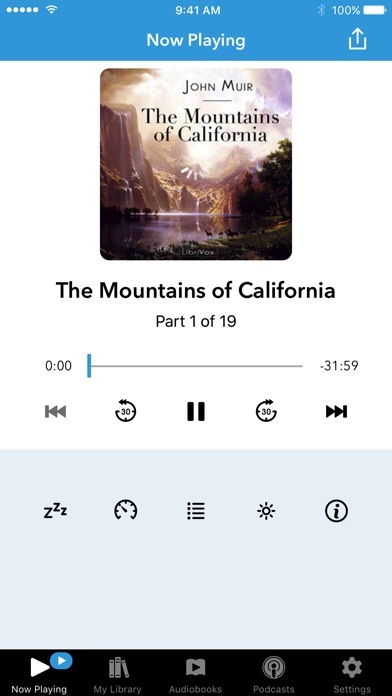 It’s a fine app, easy to use, and, yes, the audiobooks actually are free. The problem is, there are is almost no young adult literature available. Nor are there any modern titles. For me, it’s wonderful to listen to a book while drawing, knitting, or even cooking. What a great way to multi-task! When I become too distracted, the 30 second repeat gets me right back into the story, and I just discovered the timer which will hold my place and turn the app off automatically, after I fall asleep while listening in bed. Since I often leave my earbuds in and wake up next morning, many hours later, with the audio still running, this is really important to me. The selection of books is tremendous, and I am enjoying so many well known authors who’s works I hadn’t read before, as well as authors I was previously unfamiliar with. Sometimes I have difficulty understanding an orators dialect, but when I stick with it, am becoming able to comprehend the words readily, which is an unexpected bonus for me. When deciding on what to select, the book description is broad enough to give a good idea of what it’s about, without giving away the story. I recommend this app to anyone who enjoys books! I love the audio books. This site has enriched my life immeasurably. I have recommended it many times and helped people set it up on their phones. Thank you! Thank you! Numerous versions and languages. Great inspirational works by Authors Spurgion,Murray, and others as well. Asv is well read by Sam Stinson. I miss the “surprise me” function! I love this app but I do miss the “surprise me” function as I found lots of hidden gems that way! I absolutely love this app. I listen everywhere I go. Something is wrong with the downloading process. Often I have to close the app and reopen it in order to retrigger the app to resume downloading after one file has completed. It usually gets stuck once it finishes one file and doesn’t move on to the next. Sometimes it continues with the next file but almost always it doesn’t, meaning I have to close and reopen many many times for books with many files, like the ones I have that are about 60 files big. It’s very annoying and inconvenient. I tried messing around with the settings but couldn’t get the download process to work right. Please fix this! Nope. “Free” means garbage. Want a good book? Don’t try this app. I always read before sleeping but when I am wired or too tired I use audiobooks. I love the voices and the free books! A grateful user. Easy to use. Enjoy it very much! Now buggy, unresponsive during down loads, crashes frequently on 1 year old ipad 12.1.4 Speed control does not work reliably throughout. 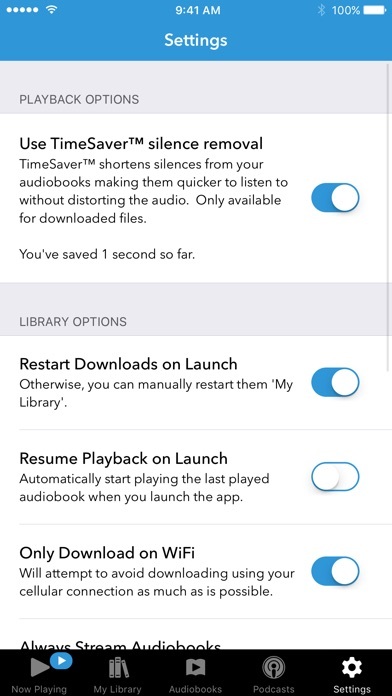 If it didn’t crash constantly, speed up a book on it own, freeze in the middle of navigating in the app, it would get 3 starts for being functional but with a UI that is old and inefficient. Karen Savage was the narrator on these and several other titles. She is fantastic. This app has been so enjoyable. I am somewhat selective with the narrators . But for a free app it has been wonderful. Thanks for offering so many great titles. Although... I’m having issues with this app running background and draining my iPhone 7 Plus battery. I’ve had this app for 5 years and LOVE IT. But turning off the background refresh didn’t work. 😢 please fix it. I've had to drive/fly many miles, and the way I have the audiobooks, on my favorite History, non-fiction books. Now on my car they play by Bluetooth thru the car radio. I decided to try this but I try to play a audio book and it freezes and won’t play. I wish it would work so could you try to fix it? Was great, now crashes every time. Since this is an all volunteer effort, all levels of experience were evident in the readers, and their volunteerism is greatly appreciated. The app’s interface is clean and easy with a good feature set: back up, jump ahead, sleep timer, etc. Enjoyable and helpful. Thanks also to LibriVox! Would be a great app if it worked. I spent hours downloading books and as soon as I closed the app all the downloads disappeared. I am a long haul. Truck driver and thought this would be perfect for me to listen to literary classics and the Holy Bible. We like to listen to good books together! This is great for us at home or in the car! Very interesting show, especially the bullying sitcom. I wish that the readers were vetted to weed out the less than adequate ones. This app sucked. It didn't have any of the books I searched. On a scale from 1-10 ten being the best I give it a negative 500. Honestly just read the book, it's better than this app. Seems to use less battery? That could be my imagination. New layout is nice. I wish there was a way of knowing if you are about to download a book you've already listened to. I have 100+ titles and slowly going down the list gets old fast. Otherwise I love this app. Great new books added with new update, looking forward to future updates! Thank you so much. This app has become a close friend, allergic to paper and struggling with fading eyesight. To all the volunteers, you have my deep heartfelt gratitude. To the creators of this app, you are doing a great job and again, my deep gratitude. The app works very well. I found this years ago and have listened to great works like Anne of Green Gables, Great Expectations, some French Poetry and other great stories. You can also pay a one time yearly fee and get an even larger selection of Audio books other than the thousands available free. I stream most audio books when home to save space on my iPad. If there is a book I really like that I want to be able to listen too, not only when home but when driving I will download it so there is no interruption from loss of cell signal. I so enjoy a good audio book and this application allows me to enjoy with ease. I was pleasantly surprised to see this app was updated today! I've gotten to know the great classics like Anna Karenina as well as some surprising favorites like Unbeaten Tracks in Japan. The download feature is great for traveling or times when you can't access wifi. I like to listen every night before bed. This app opens a door to an amazing library of literary works that are free to download. This app has helped me from stressing over the commute every day and has opened my mind to many wonderful works of literature. You will not be disappointed! What other rating could I give it? 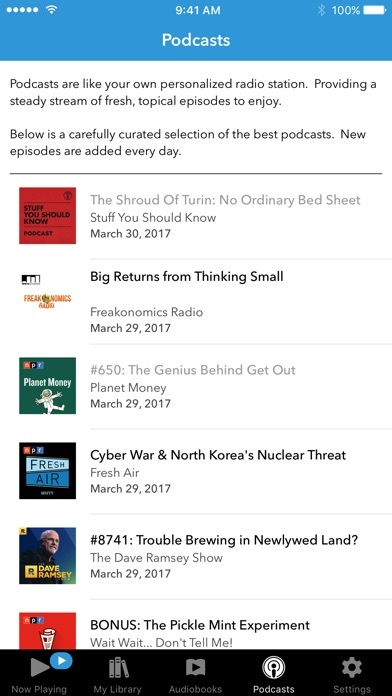 I've learned so much listening to some of these audiobooks while commuting and working out! I really really like this app and I use it all the time! The only problem is sometimes when I'm listening in the chapter switches the app seems to pause or glitch and it won't play anything for a day or two. Sometimes when I go to open the app and play a book it won't even start it just sits there on play the timer doesn't run, just silence. I've tried deleting all my books and re-downloading the app but that only fixes it for a day or two until the same thing happens again. 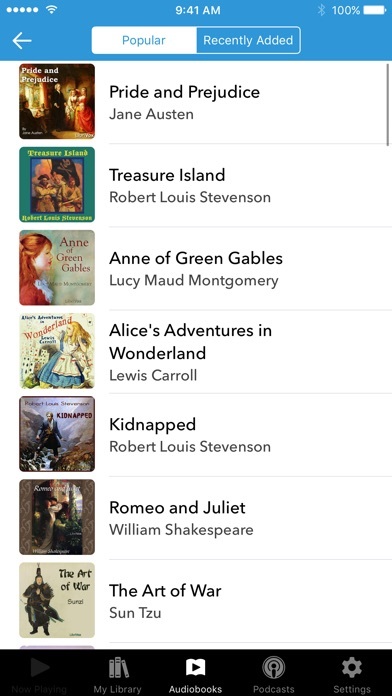 I've tried using other audiobook apps but I always come back to this one because it has such a great variety of classic books. Please fix the bug!! Loved this app. Our son is learning impaired and because of this app he is able to listen to history, the Bile, and classic literature. He says it's amazing and he seems to be able to sit and listen for long period of times. Very calming for him. He finds the readers have calming voices. Love this app. What an enjoyable listen. The only thing that would have made it better is if it had been read by an Englishman. Dickens was a master. THEY DON'T EVEN HAVE LORD OF THE FLIES! I've had this app since my 1st iPhone and with it I've experienced Sherlock, Frankenstine, Dracula, Tarzan, John Carter, treasure island, 30000 leagues, deathworld, Dr. Moreau and many many others for free! I can't say enough how happy I am with this app! I've been using this app for years and have listened to dozens and dozens of amazing books on it. As some other reviewers have mentioned, there is a glitch that causes the app to hang sometimes, usually when switching chapters, and especially if reception is spotty. However this glitch has obviously not been enough to turn me away from it completely. The new update is pretty good, and of course having access to all these classics is great. My one complaint is that we can not edit the order our books are in in the library. If I try to sort them, they go right back to where they were to begin with. Please address this in the next update. I can only download 1 chapter at a time. Very disappointed. Like the old version better. All books downloaded play in double speed with no explanation on how to fix it. I downloaded to my iPhone 6S but it says wifi only downloads. How do I change this? Why wasn't there a log-in/set-up page? I almost always use cellular only on my phone because wifi too slow (in NH). I love this app so much I absolutely cannot sleep without it! So much better than any audiobook app I've ever used!! No books show up and you don't know where they are being downloaded. I really like this app, I’ve been cruising through all the classics. My only complaints is they like to use women with thick accents sometimes, you can hardly understand them. It seriously makes me want to slap the silly out of the person who thought this was a good idea. I’m listening to the count of monte Crista it’s been an important chapter and I couldn’t understand a freakin thing she said!! She must’ve been hot to let her keep reading, these women have ruined this book for me!! I’m a mom trying to multitask and I wanted it to read to my baby and it doesn’t even work after I read my first half.!!!!! Excellent work! Hours of great entertainment. I’ve listened to a greater variety of wonderful books than I would have expected. There are many undiscovered treasures in the public domain and read by talented narrators in this app. Ten stars! Sometimes I wish I could slow the reading down a bit. It seems too fast. My rating of two stars should only reflect on the recent update. I have been using this app for many years, but since the update, the app freezes so frequently that it has become essentially unusable for me for some reason. I’m sad. Hoping for a resolution soon! I am loving this ap. There are quite a few very good readers and so many classics that I would honestly have trouble reading on my own. This is a fantastic way to tackle these works. Thank you, volunteer readers!!! Every time I open the app, it allows me to operate it for a few seconds and then it begins to lag, then it freezes and finally the app crashes. Idk what the problem is, but I hope the developers can fix it. Wonderful escape from this STUFF, very well done, far fetched but good...And FREE...Give it a listen. I absolutely love Audiobooks! I remember a time when I was read to as a child, and this evokes those lovely memories!! This is my favorite way to pamper myself with my favorite classics being read to me— whether in the car, at home, or morning walks. Love it!! The reader did a wonderful job at capturing the characters!! To say I listen to this app all the time would be really trite. I get a lot of enjoyment out of the app and it has expanded my listening spectrum to books I would never have chosen from other apps. It relies heavily on Librivox recordings to which one must accommodate. Loved The storyline, writing style, and overall enjoyment of the book. Thank you audiobooks, for letting me read it. I love that I can listen to books that I may not have picked up in a store with this App. Going through some of the classics right now. Only negative is that some books have multiple narrators. The last one has the sane guy for 15 out of 16 chapters and then for the last chapter a woman. Kind of changed the ending for me... there are a lot of talented readers and some not so much bu I am grateful the volunteered. This app is amazing! Especially for school when you need to write a book report! I would’ve rated 50 Stars if I could! The lady from Waco, Tx (sorry don’t remember her name)was excellent! I generally enjoy listening to audio books while lying in bed before I fall asleep. However, most of the Audio books I listen to come from the local library. The book that are on my phone are not that relatable to me. I am an African American and I find no romance,drama, comedy in these audio books. I find no African American narrators and basically no non fiction or fiction books in this library that I can relate to. I’ve been a huge fan of Anne of green gables since I was a little girl. I feel like the reader really captures the glory of this book. I just wish she read book 2 as well.